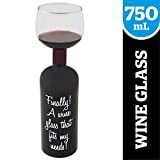 BigMouth Inc Ultimate Wine Bottle Glass – My Home Wine Bar ! Amazon Price: $17.99 (as of January 30, 2019 5:02 pm - Details). Product prices and availability are accurate as of the date/time indicated and are subject to change. Any price and availability information displayed on the Amazon site at the time of purchase will apply to the purchase of this product. Not just a fun curiosity ! Practical too for those who like to DRINK wine instead of just sipping it socially ! Finally no more judgmental looks from family and friends when you continue to refill your glass. Our Ultimate Wine Bottle Glass holds a full bottle of wine. It truly is a wine glass that fits your needs.